Many of our members have asked us to follow up our commentary about making a home dog friendly, with some specialist commentary on a cat related information for cat-sitters and cat owners. We have written this blog from the point of view of helping cat-sitters and others who may care for cats. We thought we might start by talking about cat behaviours first. Cat-sitters and cat owners all over will recognise some of these actions, postures and tips from our Vet Matthew Bayliss and a cat-sitter. Cats and Dogs are creatures of habit, and if anything changes in their day to day routines they can become quite nervous. Naturally this is not true of all pets, however, for cat-sitters and dog-sitters unfamiliar with their new charges it is worth bearing in mind. And whether you are a pet owner preparing your pets for your absence, or a cat-sitter ready to take on the responsibility of care read these tips for reference. One of the best ways to determine a pet’s reaction to something is by watching the body language. Ever wondered what your cat’s body language says? Cat-sitters and watchers in particular may be familiar with the fact that our feline friends use a wide range of signals to convey their feelings and intentions physically. So whether you are introducing a new toy, new food or even new people and pets to their eco-system a cats body language includes a variety of postures, facial expressions and vocalisations that will tell you what is going through their mind. By paying attention and taking the time to learn to read these communications you’ll be able to get a better idea of whats on your cats mind. Sainsbury’s Bank Money Matters have kindly shared a useful infographic to help you interpret these cat behaviours. Check at the end of this blog for their handy guide. 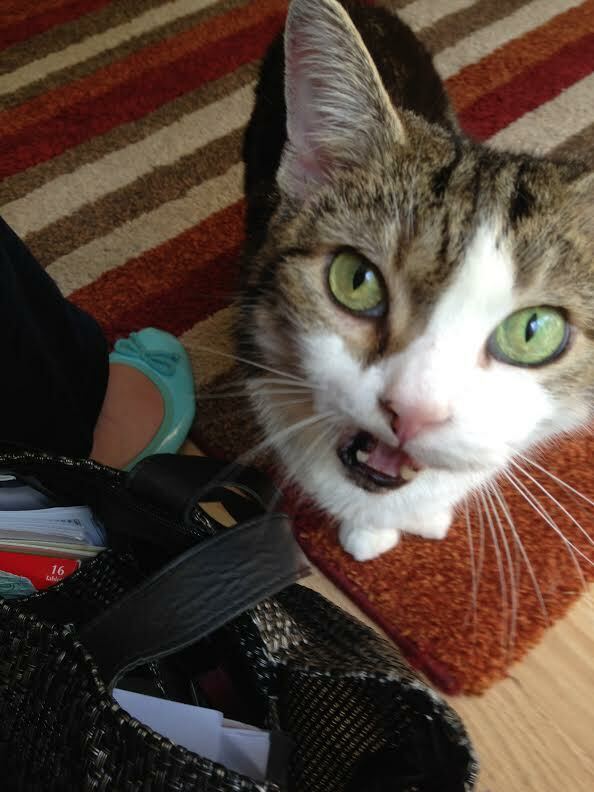 Some cats are always shy around new cat-sitters, strangers and newcomers to their home environment. 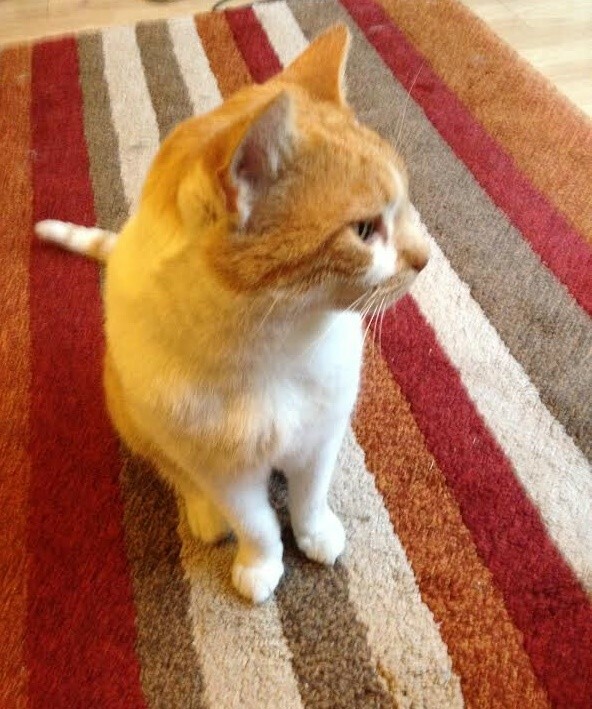 If you are organising a cat-sitter or house-sitters to care for them it is best to have time before you leave, either a ‘meet and greet’ or a day or so when you are altogether before you leave on your trip. Many rescue cats are particularly anxious around people and other animals they do not know. Experienced cat-sitters can help to manage the anxiety they experience is to keep everything else as close to the usual routine as possible in your absence: keep them at home in their own environment, ensure the food and treats stay the same with a regular feeding pattern. 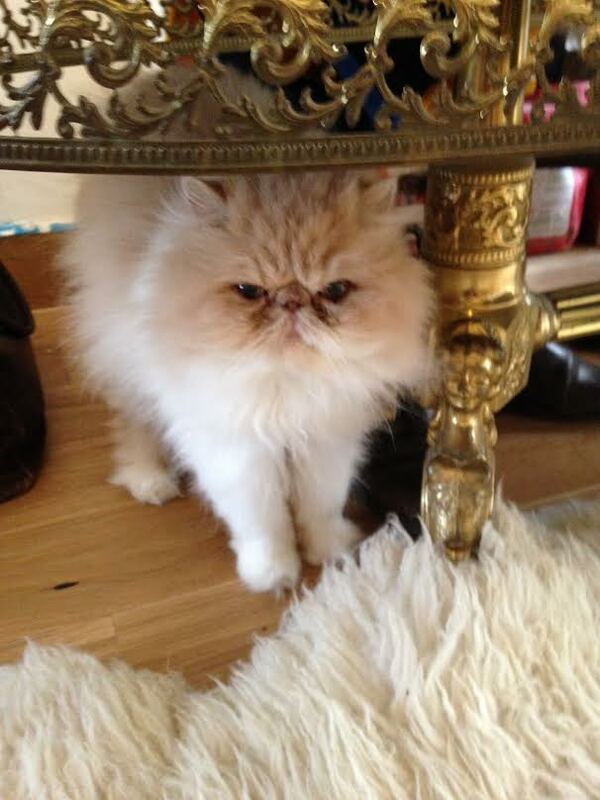 Chloe the Persian Kitten is enchanting, sweet, with a very quiet miaow, and also rather shy. As soon as I would enter the room where she was sitting, instantly she would take cover in one of her favourite hiding spaces. Somewhere safe, but with a good view of me. After a few days of regular monitoring I must have passed some test, because she began to greet me with a rub on the legs as I was fixing breakfast, and a little quiet song all of her own! Only then was I one of her approved cat-sitters. Some cats are more adventurous and are ready to greet you with ears forward, approaching you perhaps to bump you in a welcome gesture. Here is Ellie, who took no time to come straight up to me to greet me and more or less enquire what I was doing there. There was a long conversation that ensued with direct eye contact. Other cats are altogether more inclined to act with benign indifference, with their presence near you indicating a modicum of curiosity. Don’t be offended. This is a good degree of healthy acceptance. After a couple of days, a few meals and treats, there will usually be a more positive interaction. Any cat can be anxious, however if any changes occur in and around the cats environment, this can exacerbate the stress. Pre-loading the environment with pheromones (e.g. Feliway plug-in) before the event can help the cat through stressful situations, like having new people in the house. Feliway is an analogue of facial pheromones used by cats to tell other cats that this is a nice place, and I’m comfortable here, you may have seen your cat rubbing the side of their face against objects or even you – if this does happen you’re very privileged! If you would like to join our cat-sitters by joining HouseSit Match register as House-sitter and build a profile for yourself that will be seen by pet owners. Give as much information as you can about your previous experience, be prepared to share your references and any up to date police check information you have. Then you can search our listings for free to find your ideal cat-sitting assignment. Hi there to every one, for the reason that I am truly eager of reading this web site’s post to be updated regularly.